Handlepod is the only camera mount designed and intended to use your hand as a camera stabilization tool. Press it against any solid support for instant tripod-like stability. Light, steady pressure is all it takes and the support object can be anything regardless of size. Poles, columns, rails, trees—anything will work just by pressing the HandlePod against it. No attachment mechanism needed. HandlePod attached to a power pole with elastic cord. Tripod alternatives that attach to objects are limited in the size of things they can use for support. HandlePod’s elastic cord stretches to over forty inches so large supports like power poles and trees are no problem. The attachment is solid and reliable. The nylon sheathed elastic cord, though small, is incredibly strong. It will not slip or come loose. 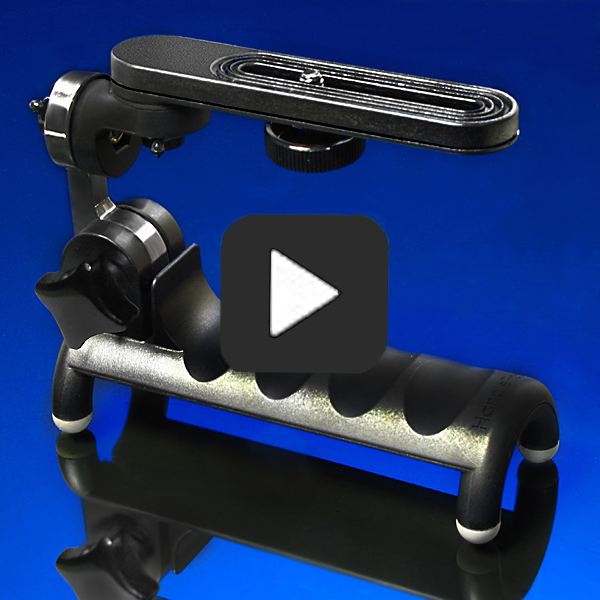 HandlePod is a comfortable handle for an improved grip and better leverage. It provides greatly enhanced stability for hand held stills in low light and shake-free video. This is particularly important for very small and hard to hold still cameras, camcorders and smartphones. Many tripod alternatives either attach to supports or sit on a level surface. HandlePod does both. It is self-supporting on flat surfaces. Use it like a mini-tripod in either landscape or portrait composition. HandlePod is one of the smaller, lighter tripod alternatives available. It easily fits in a pocket, bag or purse. Yet it will accommodate cameras ranging from a point-and-shoot to a consumer DSLR with a normal lens. It is a one-size-fits-all camera support. These are the primary advantages that raise HandlePod above the common run of tripod alternative devices. Other design features that make it unique include: The camera mount with three-axis rotation depends on friction rather than a locking mechanism. Adjust the tension screws for the weight of the camera and aiming is easy. The slotted camera mount provides plenty of clearance for the camera when it is attached to or pressed against a vertical support and positioned horizontally. Four high-friction, rubber-tipped feet straddle round or cornered supports to give four points of contact and a solid, slip-free connection. If you have need for a versatile camera support that can be used on any solid object, consider Handlepod—the ultimate tripod alternative. This entry was posted in Tripod Alternative on March 21, 2015 by main user.